The winters in Philadelphia can be as harsh as the fans when their beloved Eagles are losing. And like upset fans, cold weather can take a toll on the game, but in a far different way. This is why the owners of the Philadelphia Eagles chose to install a state of-the-art Zurn PEX Radiant Turf Heating System in the a11-new Lincoln Financial Field. The game of football can wreck havoc on the condition of the turf as the season wears on, especially as the temperature drops. When the turf drops in temperature it goes into dormancy to protect it from freezing conditions. This reaction causes the grass to be brittle and leaves it susceptible to damage from foot traffic. As a result, the fragile grass is crushed by three-hundred-pound linemen in pursuit of the goal line, leaving maintenance crews with the unenviable task of trying to rejuvenate it once the game is over. The only options in the past were to try to re-sod the worn spots and hope that the roots take hold (which they usually didn’t) and/or paint the thin spots green to make the turf look thicker than it was. But now the options are much better with the help of a Zurn PEX Radiant Turf Heating System. At Lincoln Financial Field, the turf stays warm and won’t enter dormancy until after the season is over and maintenance crews shut the heating system off. The result is a thriving, growing, and rejuvenating blanket of lush turf that provides perfect traction for a breaking running back as well as breathtaking green hues on your television screen for your viewing enjoyment. The turf heating system uses two gas-fired boilers, generating nearly 8,500,000 BTUs of energy to heat more than 87,000 square feet of field. Four circulator pumps push the heated fluid through nearly 23 miles of Zurn Pex tubing. 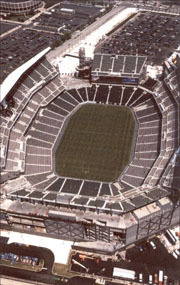 Lincoln Financial Field also chose the Zurn Flo-Thru trench drainage system. Approximately 1 ,000 feet of Zurn Perma-Trench were installed around the perimeter of the field. Perma-Trench is a 12″ wide, modular, high-density poly-ethylene trench drain. It is perfect for Lincoln Financial Field, as large quantities of rainwater and melted snow are drained off the playing surface. An additional 123 feet of Perma- Trench were installed for use as cable trays to protect electrical cables for TV cameras and communication devices from rain and snow. don’t wonder why the grass is so green in the middle of winter. The heart of Lincoln Field is heated by Zurn PEX.